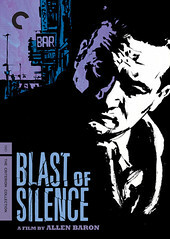 I watched the 1961 noir movie Blast of Silence the other night. A really good film, made on a shoe string budget, about a hired killer in Manhattan at Christmas on a business trip, is a lean and mean noir hidden gem. Writer and director Allen Baron also stars as the lead Frankie Bono, the hit man on a job over the holidays. Lionel Stander provides the hard boiled voice over narration that fits perfectly but is in a very rare second person narrative, even though you know it's Frankie's head doing the talking. Frankie perfers to be alone, but contacts must be made and there is time to kill as well before he can complete his job which leads to interaction with various characters - some good, some bad. Frankie begins to realize he might be looking for something more than his current profession, and it's a monkey wrench in his otherwise expertly crafted professional plans. While the plot is there to hold it together and keep things moving forward, Blast of Silence is more of a character study of Frankie Bono and his thoughts. There's no wasted moments here either, as the taut 77 minute running time plows straight forward through Frankie's business trip. There may have been better actors for the role, (Peter Faulk almost did it) but Baron plays the hitman accurately as one who is downright uncomfortable around people or situations that aren't killing related. This guy is an outsider, who just doesn't fit in, probably anywhere, and his back handed attempts at it over a lonely Christmas prove rattling to the out of place Bono. He tries to find a way around, but this being a noir, you can see plans just not coming together. The cinematography is excellent, providing the dark night streets of Manhattan along with the isolation of the busy Christmas packed crowds as well. There's one excellent shot down a New York street where the camera doesn't move at all as Frankie comes walking towards it and you can just feel the city. Like Baron points out on the DVD, the city itself was like a whole other character in the movie. And I have to mention the cars - they don't make them like that anymore. The DVD is from the Criterion Collection, and they really do this package up right. Some excellent DVD extras, including an hour long documentary with Allen Baron as he travels through Manhattan many years later retracing the steps of the film. The still photos as well show just how much the city and locations have changed since the film was made. The documentary was made pre 9/11 and the twin towers can still be seen on the water line shots. The reason this movie even made it to my attention was because of the comic Criminal (written by Ed Brubaker and art by Sean Phillips). Sean did the artwork for the DVD cover as well as writing and drawing a 4 page comic included in the DVD package that introduces us to Frankie Bono. I love Sean's gritty and moody art on Criminal, and it works perfectly here. Overall, this is a great addition to my movie collection. As a fan of noir films, it doesn't get much more noir than this one, which was actually made at the very tail end of the era for that genre by a rookie but determined movie maker who came up with a great little gem. If you like indie movies, noir films, or are just tired of the current lack of theatre hope, it's worth checking out for a hard and fast trip through 1961 Manhattan with Baby Boy Frankie Bono. Out of Cleveland. Comments on "Me Mini Movie Reviews: Blast of Silence (1961)"
Sounds like a great movie. I hardly ever watch tv anymore. I have a good collection of dvds. ... at least I think so. I don't know what I'm going to do about this HD tv cable coming about next Feb.. I suppose I'll have to break down and throw away my rabbit ears. Cable is so expensive, I've been using the rabbit ears and viewing only the local station. Thanks for the heads up concerning "Blast of Silence" you have a good day... see ya! bachelor: I'm not from the US, but in my internet travels, I've seen mention of HDTV over the air, similar to the way old rabbit ears used to work. You might need a new receiver, and perhaps a new TV, but if you want to continue to avoid cable, this might be an option. I did a quick Google search and came across My Free HDTV. With some research, you might find that you don't need to go the cable route. Again, I'm no TV expert. I don't even own a TV, but I see mention of it every so often on the technical sites I visit. Bachelor: You're probably better off with little TV. As far as I know, the rabbit ears will still work with the addition of another adapter to your TV. worth a look anyway - cable is not worth the charge. Original LRU: thanks for the tips on the HDTV options. I think maybe we should all go back to bunny ears and ditch cable. wow, I hadn't heard of this film... I feel like a total loser now. Swinebread: Don't worry about it - I hadn't heard of it either until the Criminal duo of Brubaker / Philips brought it back into the light. Glad they did, 'cause I liked it.